Antagen Biosciences, Inc. (dba Antagen Pharmaceuticals, Inc.) is a Boston-based antibody development company. Antagen scientists have developed rapid tests in lateral flow immunoassay (LFIA) format. 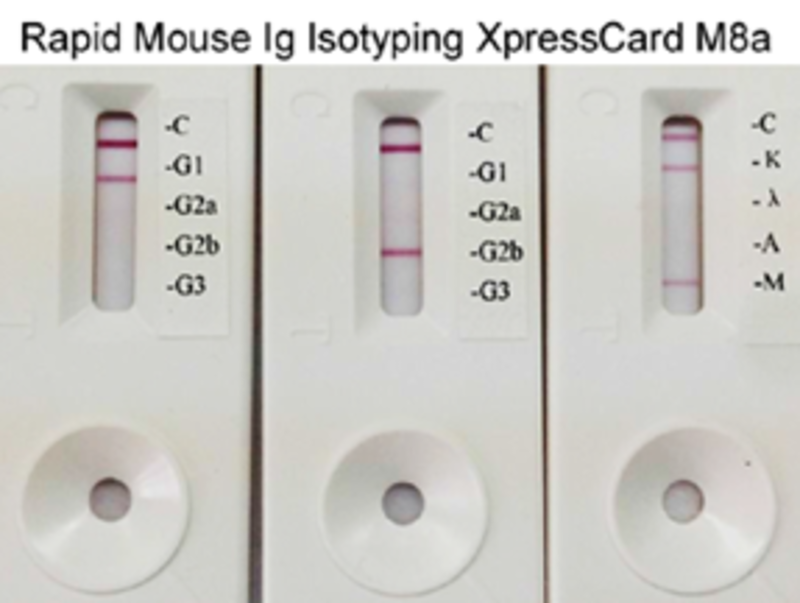 Their antibody isotyping XpressCards for mouse, rat, hamster and human antibody isotyping have the most extensive product variants to suit customer needs in the current market. Crispy clear bands appear in as little as 2-5 min, saving tremendous time and hassles for researchers when compared with using the conventional methods such as ELISA. Additionally, Antagen has developed rapid tests for quick measurement of lentivirus titres, which is a crucial step for scientists using lentivirus as a gene delivery tool for basic research or for CAR-T therapy. Our second-generation LentiTitre cassette has 4 lanes that allow sample to be compared side-by-side with lentivirus standards with known titres. Results can be obtained in as little as 5 min, compared to days by the conventional infection method. The Rapid Mouse Immunoglobulin Isotyping Kit is a five-minute lateral flow assay with ELISA sensitivity for monoclonal antibody class and subclass determination. It can determine IgG1, IgG2a, IgG2b, IgG3, IgA, and IgM, as well as κ, λ in one quick test. This rapid rat antibody isotyping kit detects 6 rat antibody heavy chain isotypes and 2 light chain subclasses (IgG1, IgG2a, IgG2b, IgG2c, IgA, IgM, kappa, and lambda) within 5 minutes, faster and more convenient than ELISA. Antagen’s Lentivirus Titration XpressCard is a rapid lateral flow immunoassay that allows quick confirmation of useful lentivirus titers in the packaging supernatants. The test detects lentiviral capsule proteins released into the packaging supernatant as a surrogate marker to determine whether virus production yields a usable titer for subsequent infection. This assay takes only 10-15 minutes, compared to the conventional re-infection based assay that takes 2-3 days.